There are not a few tragedies in the history of the church. The Crusades, the killing of those who do not line up with the Christian faith (or one particular branch of the faith), mixing the Christian faith with colonialism, particular church denominations aligning themselves with particular political parties, the despising of 2,000 years of church history…and we could probably go on and on. But one of the great tragedies of the church today is simply this: Consumerism. This tragic reality peaks its head around many a corners in many a ways. From how we tailor our services, to the teams of musicians that lead us, to the over-the-top concert-style productions, to the expectations set upon children’s ministries, to the need we feel to take pics during the gathered times of worship and post on social media, to the desire to formulate the next best hashtag campaign on Twitter, to a host of other gimmicks. We are running this thing like an entertainment center or business corporation. Saturday nights and Sunday mornings can be some of the most disheartening times on social media. Why? Because everyone joins in the chorus of posting all their fancy hashtags for their upcoming or currently happening services. From worship setlists (that’s already an odd phrase to me, as if we’re treating things as a concert) to capturing pics in the midst of the gathered worship to tweeting snappy one-liners from the pastor’s sermon, we are shaped towards consumeristic ways. Last night, one of the largest churches in America put up tweets of how all first-time guests would get a free copy of their famous pastor’s book in the morning and then followed it up with the hashtag tagline of #SitWithMe. “Sit with me” communicates “come and be entertained.” But here I was under the impression that church is a participation in the life and community of God. I can imagine this church will only have a total of 3 people to communicate anything of substance in their service. And one of those people will be the person sharing the announcements. Something says we might not be aware of words like those found in 1 Cor 14:26. And a most disconcerting thing is that so many of these pastors and churches really believe they are doing something revolutionary and edgy. Yet these kinds of consumeristic measures have been going on for a few decades now, if not more. It all sounds and looks pretty much the same. Franchising our church, style, and product. The evangelical pastor of America stands up on a Sunday morning to share a new and revolutionary vision of where the church is going. All sit with bated breath as to what this vision might be. Many churches can say in unison, “Been there. Done that,” at least in some measure. These are all mottos, MO’s, and mindsets of the modernist church. The thing is that, those who really want something authentic, something deep, something of wonder, something of beauty, something true, they will see past the ploys. These types of churches are mainly growing through transfer-growth – members of one church shuffling to the next, whether because they are looking for something “bigger and better” or because of some conflict that’s unresolved in their former church. So the seats might get filled, but will they be filled until someone else provides something bigger and better or new conflict arises? I’m reminded of Abraham and how, in Hebrews, we are told that he was looking for a city whose architect and builder is God. He didn’t see it, but he was looking. And though the paramaters might not have been 100% clear, I feel quite sure he had a sense of what it should look like. Why can’t we have prophetic, Abrahamic eyes? 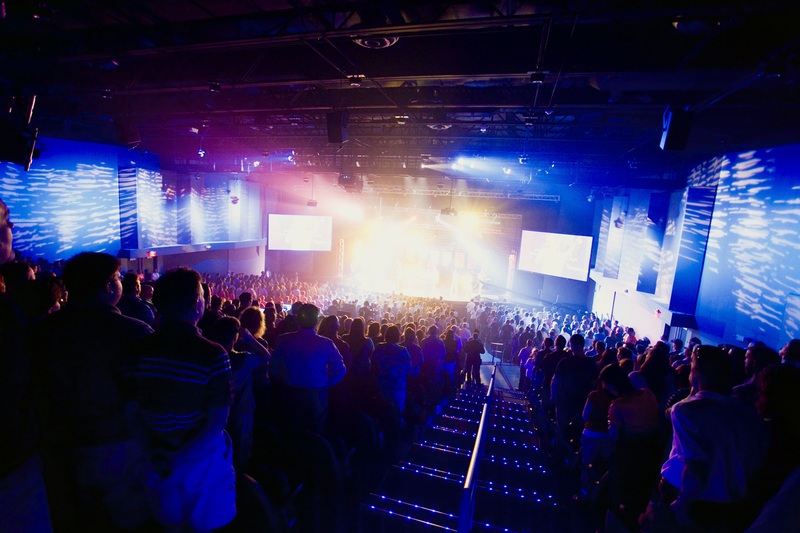 Everything looks and feels great amongst these entertainment-driven churches. There’s some really good stuff that would work well in the business and marketing world. But something is also lacking, gravely lacking. The back door is just as wide as the front. Depth and sincerity are abandoned. Nothing is taking root in good soil. We’re not truly transforming lives and neighborhoods. But we’ve got a club where we can jump around as if we’re in the bouncy castle of life or simply sit and be entertained. Sounds judgmental, I know. But I believe judgments are ok. Judgmentalism, no. Judgments, yes. And as I reflect on Scripture, the ways of the church historic, and ultimately the ways of Jesus, I’m convinced this “come and see” consumerist perspective is a far cry from anything that reminds us of Christ and the city Abraham was looking for. I believe it is literally killing us, draining the deep life of the Spirit right out of us. We need to kill consumerism or it will continue to kill us. This entry was tagged America, church. Bookmark the permalink. Ha! I’ve seen you post on Instagram. It depends. Social media uses aren’t terrible in and of themselves. But we must guard our hearts. I actually think the church website and social media used are predominantly for those who are already “in,” those already a part of us. We need to rethink the use of these tools for those in our neighborhoods, if they are to be used at all in reaching others. Honestly I do both of these things to communicate to our personal community. One good thing about social media is you can let people know what you are doing to deepen community outside of Sunday and help people grow during times away from a gathering through podcasts etc. the Sunday Setlist thing is a way for others to find the music they are singing on Sunday so they can sing it during the week. Yeah, that’s what I was saying on another thread on FB where my article was shared. We can use social media today – it’s not bad. And me posting an article and it going to social media is really a different kettle of fish from what I’m addressing here. What I’m speaking of is the focus of living for consumerist measures. There’s no perfect list of guidelines to help us know where our heart lies. But there are certain settings that we can rightly discern are excessively consumeristic. My great hope is this post can at least stir us to properly reflect on how consumerism is ingrained in us and affects so much of what we do, and then how we can become more “earthy” in our communities. Great points, thanks for the read.